Bring Back the Enthusiasm and Excitement of Learning! Bring Excitement and Enthusiasm Back to Your Clasroom! for Students to Excel in School! Help Your Students Succeed Like Never Before with SharperBrain! No matter what age they are, you want your students to do well in class. That's a tall order for a teacher, especially when the odds are stacked against you right from the start! Acting out and taking the classroom's focus off of you and onto themselves. With all these issues to manage, how can you ever teach important lessons and bring the joy of learning to your class? Whether you work with children as young as six, or adults with learning disabilities, you know how crucial it is to maintain a classroom full of students that are excited about learning and focused on what you teach. Decades ago, it was common practice to single out the troublemaker and make an example out of him or her (often in front of the class). But what many teachers didn't know then - was that the student couldn't help acting out any more than you or I could keep ourselves from sneezing or hiccupping. It's almost as if their behavior was…natural - even though it really was anything but! 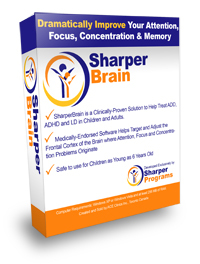 SharperBrain is a software program that adjusts the brainwave patterns in students with ADD, ADHD and LD. By adjusting these patterns, students become in control of the "signals" their brain gives off - when it's time to be calm, when they need to be focused, and when to be alert. It's something you and I don't even have to think about, but for kids suffering from ADD, ADHD and LD, it can be frustrating, overwhelming and almost impossible. When students learn, the brain naturally adjusts to fit the situation, but in children and adults with learning and attention problems, the brain isn't quite sure what to do and when to do it. The result is a hyperactive student who refuses to read silently…or a daydreaming student who can't concentrate when others are reading aloud, or a student that consistently distracts the class because they have trouble paying attention. It's indescribable to finally watch that "lightbulb moment" as a child or adult finally grasps something that they've been struggling with. It could be as simple as writing a sentence, or as intense as finishing a task while on the job. That enthusiasm and mastery of a job well done is just one more step in the direction of a life free from ADD, ADHD and learning problems. Get SharperBrain Now and Watch as Struggling Students Become Capable and Enthusiastic Learners - Almost Immediately! This program is a ground-breaking tool that can be widely used to work with all children and adults, especially those with attentional challenges and learning disabilities. Having tried the program myself and worked with children using this program I have been very impressed with the results and possibilities. Get the Facts Before You Spend A Single Dime on Classroom Management Material, Computer Learning Software or "Games"! Read case studies about how SharperBrain helped increase students' cognitive learning skills - plus see how much improvement was made during a follow-up study with students of all ages! Learn more about ADD, ADHD and LD and how to determine if one or more of your students is struggling with one or more of these conditions. See what doctors, parents, teachers and clients are saying about SharperBrain and the astonishing results they've achieved. "Improvement in Focus, Getting Homework Done without the Huge Hassle! Very Positive Strides. " SharperPrograms are rapidly gaining International recognition by end users as well as professionals. We receive regular feedback from individuals who have been using our programs. Here are a few recent ones: We have seen very positive strides (note: Warren's son is 8 years old) after about 3 weeks. His ability to focus and complete work has improved. He now asks to sit alone when completing his homework, and he is getting it done without the huge hassle! Thanks for a great product. We have now referred a few people, who I hope will see equal results. Plus, if you're still not convinced that SharperBrain is the best investment you can make in your classroom - you can take advantage of our 100% Money Back Guarantee. But once you see how well it works, you wouldn't dream of returning it! That's how confident we are that you and your students will see results!